Quora is a question-and-answer site where questions are asked, answered, edited and organized by its community of users. 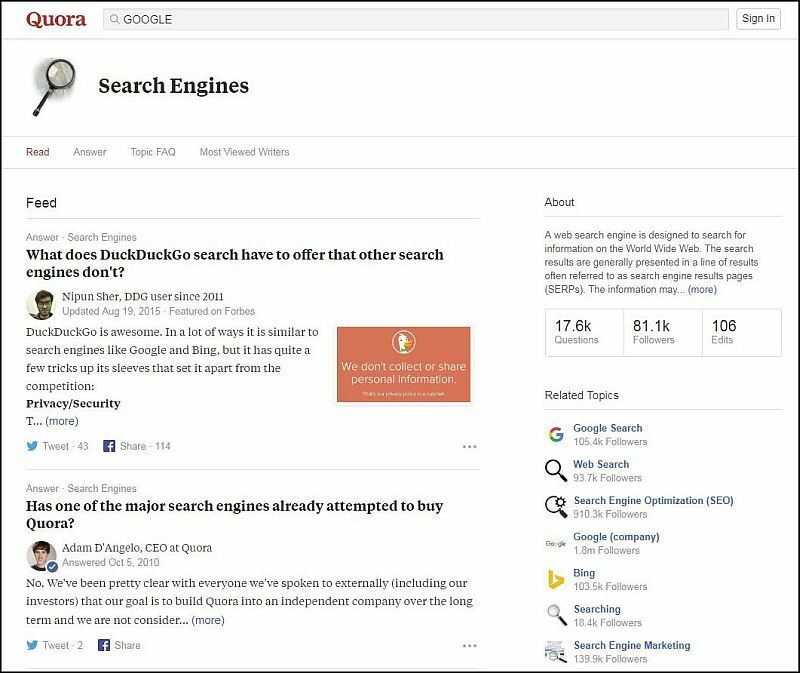 Its publisher, Quora, Inc., is based in Mountain View, California. The company was founded in June 2009, and the website was made available to the public on June 21, 2010. Users can collaborate by editing questions and suggesting edits to answers that have been submitted by other users. After you write an answer, you cannot remove or add anonymity after it’s been posted. This means that if you add your answer anonymously, it will always be anonymous, and if you add your answer publicly, it will always be public. To switch the privacy of the answer, you’ll need to delete it and re-post it. Quora has several different ways of letting you mark and remember different kinds of things. And the methods seem to change frequently. At one time Questions could be saved for later, now it’s only Answers, and so on. You can’t save Comments at all. The easiest and most effective way to bookmark anything on Quora is to use the bookmarking feature of your browser (Chrome, Firefox, etc.) or an external bookmark service such as Diigo. You can create different organization schemes with folders and/or tags, and there is usually a sync feature with backup to the cloud so you won’t lose the links if you change computers. One of the great parts of Quora is having a question answered by the perfect person, like a former Navy pilot who can explain what it’s like to land on an aircraft carrier, or a television screenwriter sharing the critical ingredients of a TV sitcom. However, when you have a specific question, you may not know the best people on Quora who can answer. Request Answers is a way to connect people with questions to people who can answer them. On a question, you’ll see suggestions for Request Answers, a list of people on Quora who can best answer a particular question. Asking someone to answer sends them an email and a notification with the request, and they can choose to answer or pass on your request. Since the system automatically saves from an open window, if you have two windows opened, or if you open a window after you’ve written something, it will save the content from whatever window is opened. You’ve got to be very careful when you have a second window opened. I’ve lost content a few times not realizing what had happened.